An ongoing exploration of the character of Dredd and how the work of Mega City One continues to evolve after the events of Chaos Day. Titan is a fantastic storyline, showing a more embittered Dredd, as the series continues to address his ever increasing age. Continuing with the ongoing examination of the fallout from the Chaos Day storyline, Judge Dredd: Titan examines how the judge penal system has been affected and the consequences of this for Mega City One. The cover of Judge Dredd: Titan is somewhat misleading. 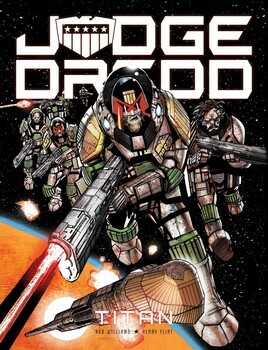 The graphic novel starts out, much like the cover, with a platoon of space marine Judges descending on Titan, which in the Dredd universe is the penal colony for rogue Judges. This bombastic scene-setting implies that the storyline will be one of pulse-pounding action and heavy-duty hardware, but the reality is far different. What we have instead is a much quieter story examining torture, the human rights of prisoners and post-traumatic stress. The supporting stories that follow make up for the shortfall in expected action. Enceladus: New Life is an excellent story, seemingly inspired by John Carpenter’s Ghosts of Mars. The over-arching Titan storyline then concludes in Enceladus: Old Life, which is seemingly inspired by The Thing (including the prerequisite flamethrower). Henry’s Flint art through the series is fantastic, able to keep each character distinct despite the number of matching uniforms, whilst also conveying the speed and action without losing any of the detail. Rob Williams’s writing perfectly captures Dredd’s personality, with the character’s bloodied determination perfectly encapsulated in the horror of the situation that Dredd finds himself in. However, the story seemingly jumps forward at random points, or moves to a different location, without establishing a scene-change, making for a disconcerting read. Despite these narrative speed-bumps, Judge Dredd: Titan remains a fantastic storyline showing a more embittered Dredd as the series continues to address his ever increasing age.